Member of the Virginia House of Delegates 1978-80 and 1982-Present. Party Chairman of the Democratic Party of Virginia 1998. 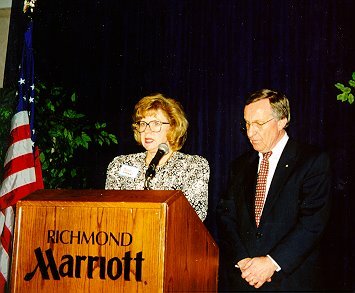 (Picture of Kenneth Plum taken with outgoing Democratic Party Chair Sue Wren at the Jefferson-Jackson Dinner in Richmond, Virginia, March 7, 1998). from the balloting. Plum, a high technology expert, former educator, and long-time supporter of reproductive choice, was the only candidate to win support in all 11 congressional districts of the state" (Carolyn Corry, 1998). Upon his election as party chairman, Kenneth R. Plum(D-Fairfax), "promptly pledged to concentrate on three central goals: sharpening the Democratic message at a time when Republicans enjoy enormous momentum across Virginia, redoubling the party's efforts to raise money, and rebuilding a demoralized activist base" (R.H. Melton, The Washington Post, March 8, 1998). "'Rebuilding a party happens by deliberate plan -- nitty-gritty, shoe-leather, door-to-door,' he added. 'People are much more compassionate and caring than we give them credit for. Some pretty mean-spirited people have gotten elected recently. We will get our message out'" (R.H. Melton, The Washington Post, March 8, 1998). "Not a moment too soon, several senior Democrats said today. 'The party needs to be on the offensive,' said former U.S. Senate candidate Mark R. Warner ... 'We need to set the agenda instead of respond to an agenda,' Warner said" (R.H. Melton, The Washington Post, March 8, 1998).